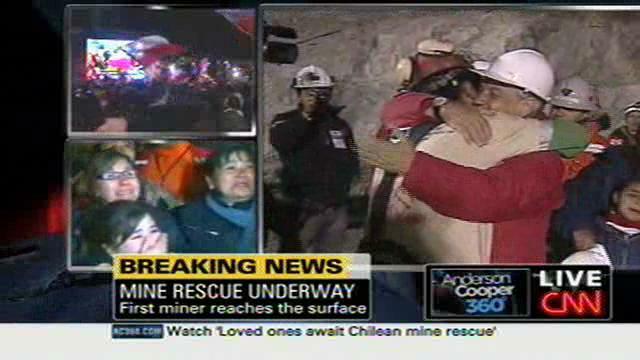 With all eyes tuned into the cable news outlets watching the Chilean miner drama, more viewers were watching the actual first rescue on CNN, while Fox News dominated the balance of the evening with total viewers. With politics out of the picture, MSNBC fell far behind (even though they stayed with live coverage of the miner rescue as well). It was basically a typical night for MSNBC, as well as much of FNC prime time. Fox News got a boost at 11pmET and beyond, but the second hour anchored by Greta Van Susteren saw CNN take the lead – and saw the biggest improvement by far. Let’s see if that keeps up tonight: the network airs the Delaware Senate debate from 7:30-8:30pmET followed by a live Parker Spitzer for a half hour.